Readers of the KDE Commit-Digest have probably noticed that Gilles Caulier is again on top with number of commits. On what does he work so furiously? Gilles is the main developer of Digikam which is under transition from KDE 3 to KDE 4 whilst simultaneously adding new features. Read more to know more about the future of advanced digital photo management for KDE and Linux. There are many improvements including a cleaner user interface, improved performance, a new thumbnail bar, XMP support, ability to run on Mac OS X, GPS tagging using Google Maps, multiple album collections supporting collections on network shares and removable media, and auto gamma and white balance with RAW. Digikam is also the first open source photography tool with 16-bit colour depth support. Gilles Caulier tells all. We have plans to release 0.10.0 in September, if all goes well. Regression tests will take a while. I would not provide a "stable"
simplification and various other improvements. production, at least until the first release candidate. libkipi (partially re-written and cleaned). I present here a few screenshots of Digikam for KDE 4 in action. considered a preview, but we want to finalise this interface for the Beta 1 release. included the thumbbar in the Image Editor (F4) and in the AlbumGUI with Preview mode (F3). The same cache is used everywhere. to be more similar to other tools available under Mac OS X or Windows. application under Mac OS X.
removable media and network repositories. There will be no problems with using Digikam with a NFS server to host your images. 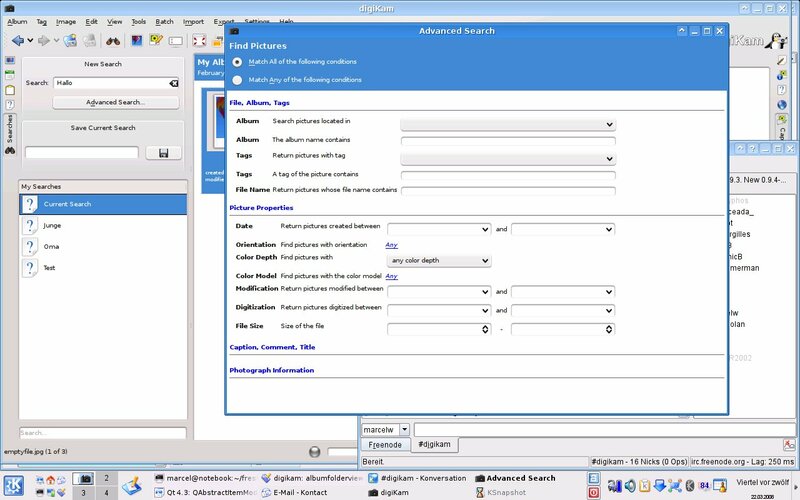 preferred scheme), Digikam looks similar to professional software available commercially. image in the editor. Without colour management, the user would see only a black hole image. This is due to limitations of the dcraw library, which does not provide a homogenous interface between 8-bit and 16-bit colour depth workflow. On the left by dcraw in 8 bits colour depth and converted to PNG. method: for example, LightZone uses this style of workflow. Note that this feature was also backported to KDE 3. Krita to also work with layers. We want Digikam with Krita to be considered the perfect photo suite. On a final note, we would like Digikam to take part in Google Summer of Code: here is a list of potential projects. stab at KDE 4.0 release? > I would not provide a "stable" release full of bugs. Re: stab at KDE 4.0 release? the irony is that a little further below you complain (rightfully) about how it wasn't possible to develop against the always moving libs from last summer (pre-4.0). 4.0 specifically, purposefully addressed that issue by getting the core functionality moved to "stabilize! complete features!" rather than "more new developments!". the expectation was that this would allow application developers such as yourself to get your efforts on track instead of being continuously held up by a never ending library development party. 4.0 is not a stable release. It is a development release. 4.1 will be the first stable release. And what about printing interface ??? Can you said than KDE 4.1 will be the first release ready to use in production if printing interface cannot be used ? printing already works in trunk/, so there's no need to wonder idly anymore. it uses the printing support from Qt 4.4 and it's progressing rather nicely. Thanks for the info Aaron. I wil review digiKam printing code in this case. Well, then why is KDE filed under the "Stable" section on kde.org? And why does the release annoucement for 4.0 not contain any warning about this being a relase targeted mainly at developers? Not that I intend to beat a dead horse but I'm also somewhat allergic to revisionism. And I don't count developer ramblings on obscure blogs and mailings lists. kde.org being the main internet portal for KDE is as official as it gets. And it states that 4.0 was stable although reality disagreed on a regular basis. Anyway, 4.1 looks like it's going to be a solid release and with 4.2 most applications should be finally ported. When i have started to port digiKam to KDE4 at July 2007, i have seen imediately several problem in core libraries. I don't speak about full desktop which for me have been unsuitable at the date. This is why is have never planed to try to plan digiKam 0.10.0 for the first KDE 4.0 release. It been impossible to have a stable appplication. You have right. KDE 4.1 will be better, and certainly KDE 4.2 the first release which can be used in production. This is not a critic. It's just the reallity. And if you look into the pass, the same situation have been seen with KDE 2.x to KDE 3.x transition. thankfully the number of real regressions has been rather small. there are some important ones, mostly that we knew about already due to technical issues we ran into (the ssl and proxy issues are good examples o those). > It been impossible to have a stable appplication. it may have impossible for digikam, i can see that, but dozens of apps shipped for 4.0 and were quite stable. that said, you're quite right about "chasing a moving API" being a major blocker for application developers. getting 4.0 out the door was a vitally important step for addressing that and increasing the stability / lowering the regression counts in the core libs. this happens best when drastic new changes aren't happening any more, more applications stress it and more users do different things with it. it's far more pleasant and realistic to develop apps against the kde4 libs at this point. as such, i think we'll see a bloom of applications in the 4.1-4.2 timeframe, digikam being a good example of that with it's release date of september. Reading the note about the Google Maps/Marble integration made me think - is there an underlying system (one of the new KDE4 backends) that handles map integration? It would be better if the choice of map 'server' was determined system wide and applications queried through a single API. That way any application needing to show map information, positioning etc. could do it in a simple unified way - and this could be easily configured to individual (or local) preferences. Also, a more general question - is there a KDE4 API for access to any other data sources like these? btw. Digikam looks very nice... as does the KDE4/dark theme (where is this available?). Having a "Map Application" is already quite a step forward. As Marble supports the KML format (the one that's also used by GoogleEarth), it can probably be integrated with other "Map Applications" as well. Hah of course :) I like what I see - it just set my mind whirring! Marble integration in digiKam right side bar is now complete on my computer. I will polish the code and commit this evening. Done in svn with Rev. 793334. "btw. 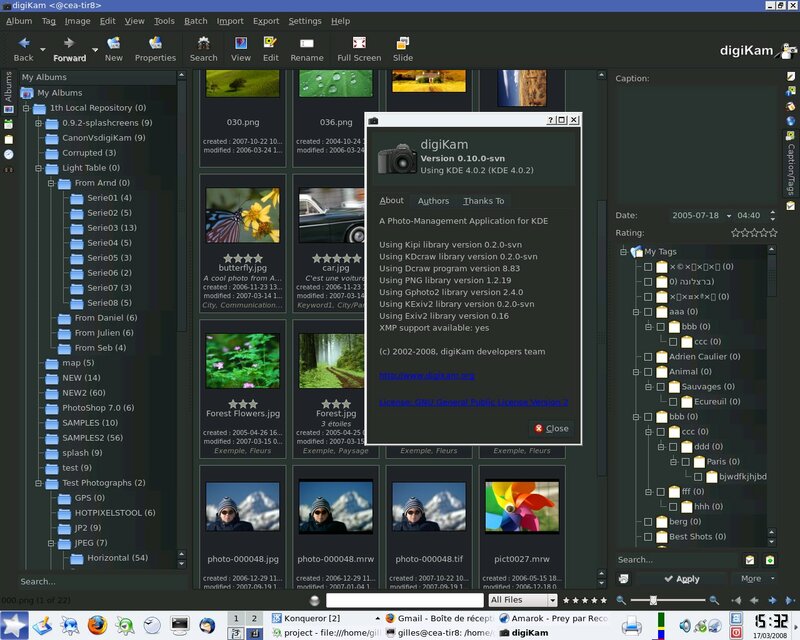 Digikam looks very nice... as does the KDE4/dark theme (where is this available?)." If im correct, that isn't a KDE4 color schema, it's Digikam own. Last stable version Digikam has supported limited color schemas, where user could select only a preview background, selected/non-selected image background and foreground and text effects for special text (labels and tags and rating). But now Digikam has new theme possibilities what allow to change digikam window color to anykind you like, without effecting to other KDE applications. Example, you can have blue-white color schema on KDE but then make a own color schema with digikam own theme tool and apply it so digikam window is using colors what you selected, not blue-white what is applyid from KDE control panel. This is very important feature to bring digikam as a professional application because colors should be so much middle gray as possible and this has be impossible. "If im correct, that isn't a KDE4 color schema, it's Digikam own." Middle gray is 127, 127, 127 (RGB 0-255 settings) but because it's computer monitor what has backlight and not gray-card what reflects light, it might be better to have 64, 64, 64 colors. Middle gray is needed because other wise other surrounded colors affecst the photograph colors and it's "developing" is harder. I were once in a great studio where was own room for Photograph manipulation, there were 15 PC's in that room, whole big room was painted with middle gray, all stuff there was middle gray and there were special lighting what were calibrated once a week and few times a week every monitor were calibrated (all monitors were those 10-14bit and not normal 8bit monitors). And then admins allowed normal users to use wallpaper what user liked. With middle gray, all colors will be seen much easier and neutral as possible. What's the point of such an abstraction? Why not just use Marble directly and drop support for the proprietary Google Maps (now that we have a Free alternative in KDE)? Resolution of maps in Marble are limited. If you want more details, we need advanced tool. googlemaps is fine. Does anybody know where openSUSE (11.0 factory) users can find the new digikam? It seems neither to be available as single package nor in some extragear-RPM. This is strange, as for any other KDE4 package than Digikam (and, equally unfortunately, k3B) openSUSE offers superb support and up to date packages., even of development versions. Only for these two apps, my favorites beside Amarok, you can't use a KDE4 version. They are still in alpha state, it is not very common (for any distribution) to provide alpha quality software by default. You can create a kde-devel account and compile them from svn everyday, like I do. That not hard at all, and you have cutting edge apps everyday. There is again new suggestion for selecting files, currently i use double click mode and i like ctrl+shift modes because those works for everything else too, on SVG editing, image editing and text editing, not just file management. It's just very dificult way to get something better when there is so many posibilies what use one way but cant work with others. you rock, n1 photos !!! "They are still in alpha state, it is not very common (for any distribution) to provide alpha quality software by default." Obviously you have either not used openSUSE or not read my posting ;). openSUSE DOES provide quite commonly a wide rande of KDE4-and-apps-RPMs, mostly unstable development versions (e.g. a pretty usable KDE4.1 snapshot repository, updated every few days). That means the average openSUSE user does NOT have to use a SVN account, nor to compile any program, but must only add a "KDE:UNSTABLE" repository to the system. However, while there are lots of other software pieces, from pretty usable to "crashing all the time" state in this repo, I cannot find neither Digikam nor K3B (which is told to be quite usable already). "I have included the thumbbar in the Image Editor (F4) and in the AlbumGUI with Preview mode (F3). The same cache is used everywhere." Is there still possible to use current view style and not thubbar? I mean that old where are thumbnails and when user double clicks image, it gets open to editor or big preview? Yes, in editor, View/Show Thumbnails menu option. In Algum GUI, i have forget to add this option. I will fix it. Of course, you can reduce to minimal size the widget separator betview icon view and thumbbar. Nice! 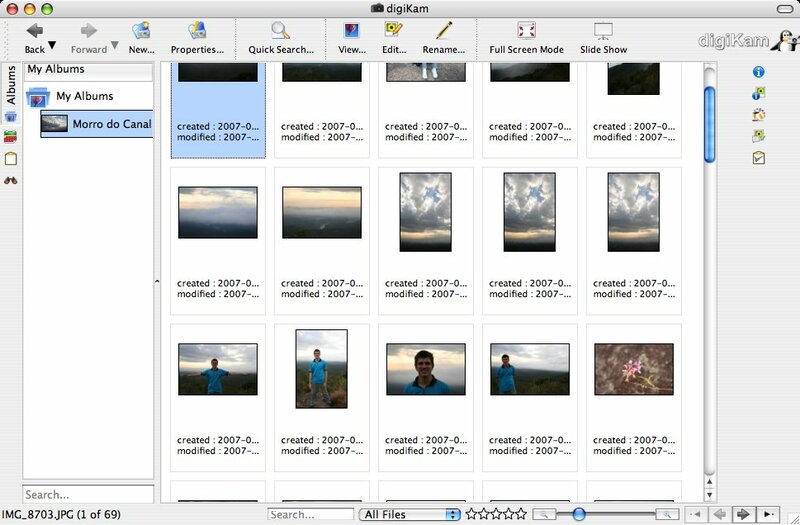 DigiKam just looks more and more very professional application, it has be very pro as in usage but now it looks too! Looks like Digikam is going to ROCK when it arrives for KDE4. Here you can see more screenshots of new Advanced Search dialog. I really love Digikam, thanks!!! any plan to use Phonon for the embeded video preview ? What about going from version 0.9.0 to 1.0.0 instead of 0.10.0? I would reflect the mature state that DigiKam is in, so it would definitely be justified. Just like K3b - time was overdue. I know that version numbers are controversial sometimes and that some will criticize your chosen number as hype-driven and being purely for marketing reasons if you put the number too high. (Well some people will always nag if you don't prefix with two zeros and have an -alpha appendix if they experience a crash and if you don't have the feature list of commercial alternatives). And at release time it certainly would give you extra marketing - big version jump instead of simple port is more newsworthy for many more sites. You could surely reach more photographers and increase your userbase, especially if you have a Mac/Windows port ready, and with the KDE4 port I'm sure that the codebase is ready for that. And you could show people that they can trust the app and that basic features are not a problem. Not only that, with so many pro level features that stage is long behind. This subject have been already discuted on digiKam mailing list. I'm not favorable to toogle now to 1.0.0 version... A fondamental feature is not yet implemented : a powerfull backup/restore tool. With all the respect due, and even if others "pro" apps on other platform have this fuction, I don't think this is what makes Digikam a 1.0 program or just a 0.10. Backup/restore policies should be something outside the scope of a user program and should be part of the "operating system". ... for Joes like me, I'd rather see the tagging GUI improved. Using the mouse to click checkboxes is so slow! It would be better to have a good autocompletion feature so tagging could be done entirely from the keyboard. just an other idea (I know dot.kde is not bugzilla but well...) : when I tags a lot of picture, I often works in thumbnails mode and select all pictures that I wants to be tagged with a particular set of tags. And often, I release "ctrl" for the multiple selection and lose all my selected images (and then I cry). Maybe the way Dolphin does allow you to select several items by using a small icon overlaying the item might be a solution. I'm currenty working on, for KDE3 and KDE4 version.